Janay's tutor reviewed the basics of reading. Janay remembers overhearing a teacher tell her mother that she would never learn to read. In a cash-strapped school district, where class sizes were large and teaching resources were limited, educators focused on helping Janay overcome a speech impairment, not on addressing a learning disability that made it difficult for her to decode words. 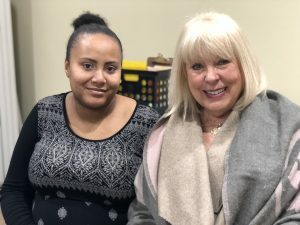 She graduated high school reading at an elementary reading and went to work as a stock clerk at a retail store, but she never gave up her desire to become a strong reader. Then her mother had heard about Oakland Literacy Council. Janay finally received the personalized instruction she needed. Her tutor, Mary, has had special training in remedial education. “I told Janay it’s not her fault that the English language is so difficult,” Mary explains. “It’s like a puzzle you have to figure out.” Mary came armed with phonics lessons. Together, they reviewed the basics of reading, filling in gaps in Janay’s education. Week after week, they met at the library for two hours at a time. “I want to make sure my daughter knows how to read before she goes to school,” Janay says. somed. She thought to herself: “I actually can get this.” Her tutor, she says, has taught her more than she learned in grade school. With a baby on the way, Janay had an extra incentive to build her reading skills. “I want to make sure my daughter knows how to read before she goes to school,” Janay says. Now, Janay reads to her daughter, Lola, every day. She loves it when Lola toddlers over to her with a book in hand.